Gorham is a town in Coos County, New Hampshire, United States. The population was 2,848 at the 2010 census. Gorham is located in the White Mountains, and parts of the White Mountain National Forest are in the south and northwest. Moose Brook State Park is in the west. The town is crossed by the Appalachian Trail. Tourism is a principal business. It is part of the Berlin, NH–VT Micropolitan Statistical Area. 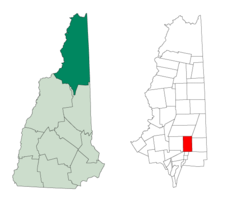 The primary settlement in Gorham, where 1,600 people resided at the 2010 census, is defined as the Gorham census-designated place and is located between the two intersections of US 2 and NH 16, along the Androscoggin River. Construction of the Cascade Mill began in 1904, by the Brown Company. The community was first chartered in 1770 by Colonial Governor John Wentworth as a part of Shelburne, called "Shelburne Addition". Gorham was first settled about 1802, by Robert Sargent and others, but for years it contained little more than rocky farms, small logging operations, and a few stores and stables. When incorporated in 1836, the town had only 150 inhabitants. It was named "Gorham" at the suggestion of Lot Davis, a resident from Gorham, Maine, and a relative of the Gorham family which incorporated that town in 1764. The St. Lawrence and Atlantic Railroad (later the Grand Trunk Railway) arrived in 1851. Located halfway between Montreal and the New England seacoast, Gorham developed into a railroad town, with a major locomotive yard and repair facility. With trains came tourists, and the Mount Madison House, Alpine House, Gorham House and Willis House opened. Crowds went from Boston and the seacoast to White Mountain Station, and from there to the Glen House in Pinkham Notch and Mount Washington. In 1861, travelers made the first trek up the Mount Washington Carriage Road, winding 8 miles (13 km) to the summit of the 6,288-foot (1,917 m) mountain. "The Road to the Sky" was an engineering feat of its day, advertised as "the first man-made attraction in the United States." It would be renamed the Mount Washington Auto Road, and remains popular today. Railroads benefited local industries as well, hauling freight for mills run by water power from the Androscoggin River. Logging flourished, with boards and building timber manufactured by the Libby and the Peabody lumber companies. That business would eventually decline, as would railroads. In 1973, the town's train depot, built in 1907, was scheduled for demolition. The Gorham Historical Society saved the building, which now serves as a headquarters and museum. It features displays on area history, with a collection including locomotives, boxcars and a caboose. According to the United States Census Bureau, the town has a total area of 32.3 square miles (84 km2), of which 31.9 sq mi (83 km2) is land and 0.4 sq mi (1.0 km2) is water, comprising 1.27% of the town. Gorham is drained by the Androscoggin, Peabody, and Moose rivers, and the smaller Moose Brook. Gorham lies fully within the Androscoggin River watershed. Gorham is bordered to the north by Berlin, northeast by Success, east by Shelburne, west by Randolph, southwest by Thompson and Meserve's Purchase, south by Martin's Location, and southeast by Bean's Purchase. The highest point in Gorham is along its western border, on a spur of Mount Madison, where the elevation reaches 3,030 feet (920 m) above sea level. While Gorham itself is surrounded by larger mountains, a small prominent peak within the town is 2,400-foot (730 m) high Pine Mountain. As of the census of 2010, there were 2,848 people, 1,301 households, and 802 families residing in the town. There were 1,487 housing units, of which 186, or 12.5%, were vacant. The racial makeup of the town was 97.0% white, 0.1% African American, 0.2% Native American, 1.1% Asian, 0.0% Native Hawaiian or Pacific Islander, 0.04% some other race, and 1.5% from two or more races. 0.9% of the population were Hispanic or Latino of any race. Of the 1,301 households, 25.6% had children under the age of 18 living with them, 49.7% were headed by married couples living together, 8.2% had a female householder with no husband present, and 38.4% were non-families. 31.9% of all households were made up of individuals, and 15.6% were someone living alone who was 65 years of age or older. The average household size was 2.19, and the average family size was 2.73. In the town, 19.4% of the population were under the age of 18, 5.4% were from 18 to 24, 21.8% from 25 to 44, 34.7% from 45 to 64, and 18.8% were 65 years of age or older. The median age was 47.0 years. For every 100 females, there were 100.1 males. For every 100 females age 18 and over, there were 95.0 males. For the period 2011-2015, the estimated median annual income for a household was $51,190, and the median income for a family was $63,071. Male full-time workers had a median income of $45,432 versus $33,542 for females. The per capita income for the town was $28,508. 7.5% of the population and 4.5% of families were below the poverty line. 12.0% of the population under the age of 18 and 9.0% of those 65 or older were living in poverty. Dr. Albert C. Johnston, an African-American doctor who, along with his wife and children, hid their racial identity. William Lindsay White later published a book, Lost Boundaries, about the family, which became a film in 1949. ^ a b "Some Highlights of Gorham History" (PDF). Archived from the original (PDF) on September 14, 2012. Retrieved July 17, 2012. ^ "Gorham Historical Society & Railroad Museum". Retrieved October 10, 2017. ^ a b c "Profile of General Population and Housing Characteristics: 2010 Census Summary File 1 (DP-1): Gorham town, Coos County, New Hampshire". U.S. Census Bureau, American Factfinder. Retrieved October 27, 2017. ^ "Selected Economic Characteristics: 2011-2015 American Community Survey 5-Year Estimates (DP03): Gorham town, Coos County, New Hampshire". U.S. Census Bureau, American Factfinder. Retrieved October 27, 2017. Wikimedia Commons has media related to Gorham, New Hampshire. This page was last edited on 14 November 2018, at 16:21 (UTC).